Staff photo by Steve Muscatello New Ulm first baseman Luke Scheid hangs onto the ball for an out during the Eagles win against Mankato West in the Section 2AAA championship game Thursday at Mueller Park in New Ulm. 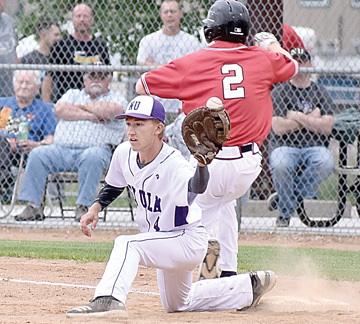 NEW ULM — Luke Scheid’s two-out single in the bottom of the 11th inning scored pinch-runner Wyatt Roberts from second and gave the New Ulm Eagles a 2-1 win over Mankato West and the Section 2AAA title Thursday at Mueller Park. Brandon Seidl got the win in relief for New Ulm (20-3). 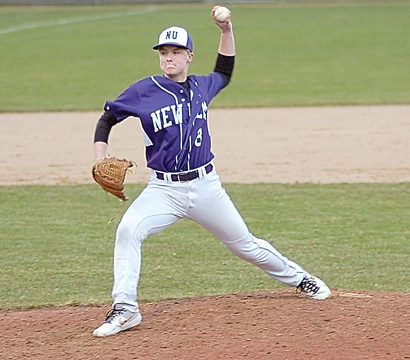 Seidl took over for starter Tyler Roufs, who went 8 2/3 innings and allowed just one run — and unearned run in the second inning — and struck out eight. Ben Hopper took the season-ending loss for the Scarlets (13-11). Scheid, Jaden Domeier and Roufs each had two hits for the Eagles. New Ulm now advances to the AAA State Tournament next week at Siebert Field. New Ulm started the rally when Braden Zimmerman walked. A strikeout and a Seidl sacrifice bunt moved Zimmerman to second. Hunter Ranweiler was intentionally walked by Hopper to face Scheid. It was a game where the Eagles had a lot of chances to win in the seventh, eighth and ninth innings were they stranded five runners, all of them in scoring position. 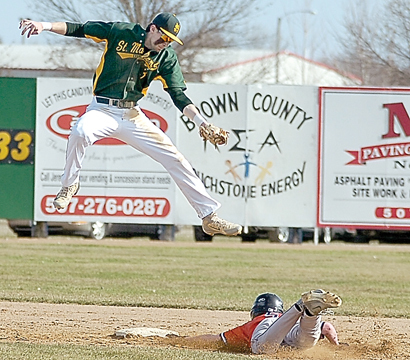 “We had opportunities and got runners on base but we could not finish it out,” Scheid said. West had taken a 1-0 lead in the top of the second when Avery Miller singled and Andrew Mihm was safe on a New Ulm infield error. A Sam Vossburg base scored Miller. The Eagles knotted the game in the fourth when Jaden Domeier singled. Roufs followed with a base hit. Domeier rounded second and collided with Scarlets’ shortstop Hopper and was awarded third on obstruction. Domeier scored one pitch later on a balk.